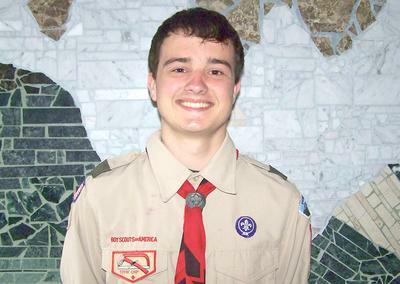 Cody Eaton is about to embark on a community project to gain Eagle Scout status. In March, the Boy Scouts of America approved Cody Eaton’s Eagle Scout project proposal to create benches for designated Island Heritage Trust properties across the island. In the Boy Scouts, the Eagle Scout status is the crowning achievement after years of dedication and commitment to scouting, and it is the symbol of an outstanding community contribution and accomplishment. The purpose of the required project is to provide a service to a community, and it is an opportunity for Eaton to demonstrate the planning, development, responsibility, and leadership skills he has acquired during his years in the Boy Scouts. Eaton is a junior at Deer Isle-Stonington High School and is the last member of Troop 144 on Deer Isle. He continues a family legacy of national and community service, starting with his great-grandfather, William Hutchinson, who served with the Marines in WWII and was present at the invasion of Iwo Jima. Many of his family members have served on Memorial Ambulance including his great-grandmother Sarah Hutchinson and currently both his grandparents, Wilda and Richard Eaton. Richard Eaton is also an Army veteran and Wilda Eaton is Memorial’s Chief. Cody Eaton also follows a family connection in scouting, as his father Chris attended Boy Scouts, his uncle Andy Eaton reached his Eagle Scout rank, and his aunt Pam Wendell was in the Girl Scouts. As an Eagle Scout candidate, Eaton must plan, direct, and follow through with a project that will better his community. His approved project is to design and build a series of benches that will be placed on Island Heritage Trust trails in Deer Isle and Stonington. Eaton has drawn up plans for the benches, calculated cost, decided on materials, has connected with IHT, and is now starting the process of fundraising and organizing his helping team. “I am planning on making at least six benches, but if I get more money, I will make more,” Eaton said of his project. With the target amount to raise $1,000, he hopes to meet his fundraising goal this spring so he can make and place the benches in time for this summer season. At the culmination of his project, and receiving his Eagle Scout rank, Eaton will become part of this distinguished group that includes, among many others, local Eagle Scouts Ian Pelletier, Calvin Lawson, Ben Hardy, Curtis Weed, Blake Billings, Adam Vickerson of Deer Isle and Henry Sullivan, currently a firefighter in Loudon, Virginia, of Brooklin. He will continue his commitment to Eagle Scouting this fall at the Philmont Scout Ranch in northern New Mexico for a rugged, 12-day, backpacking expedition learning Wilderness First Aid, rock-climbing techniques, along with other wilderness survival skills. To help Eaton with his fundraising, donations can be sent to P.O. Box 265, Stonington 04681, payable to Troop 144 with “benches” written on the memo. “I am the last Boy Scout of Troop 144, so I want to finish strong,” Eaton said.